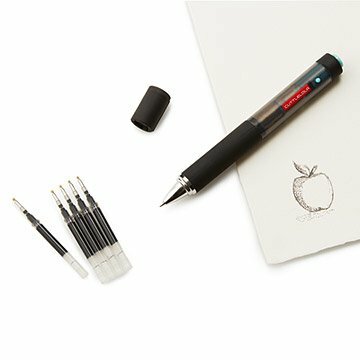 This rechargeable, automatic stippling pen lets you create intricate drawings without wrist strain. Connect the dots of creativity with this unique, award-winning drawing tool. Easy to use, the rechargeable, automatic stippling pen lets you create intricate drawings without wrist strain. It features two speeds, a USB cable for recharging, five ink refills, and a handsome metal case for presentation and storage. It makes a great gift for budding artists or drawing devotees who want to try a new tool or technique. Made in China. Includes a box, USB cord and 5 black refill cartridges.